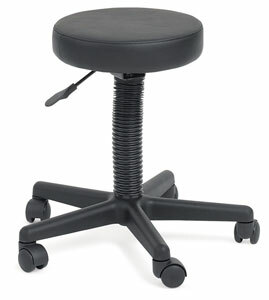 A versatile stool that’s ideal for any studio, home or office work area in need of a drafting-height seat. It swivels and features pneumatic height adjustment from 17¼" to 24¾" (45 cm to 63 cm). The 13" (33 cm) diameter seat is made of super-soft molded foam for hours of comfortable sitting. Roll wherever you need to go on the 22" (56 cm) diameter, five-star base with hooded casters.